According to the Sally Fallon Morell and the Weston A. Price Foundation, the short answer would be that 4 months is too early to introduce solids to some babies, and not too early for others if they are developmentally ready. There have been concerns expressed in our community about this position. Some have stated the gut is not sealed until 6 to 8 months, and therefore solids should not be introduced until then. Some recommend the later the better, and even advocate that a baby be exclusively breastfed until 12 months. [The] majority of babies are ready to be weaned by 6 months, but many babies are ready earlier – they start getting hungry because they don’t get enough from the mother’s milk. To add formula to those babies is not a good idea, it is much better to start adding real foods. Sally Fallon Morell is absolutely right – no grains, beans or any other starchy and difficult to digest plants. Start according to the New Baby diet on my website and in my book. Animal foods – meat stock, meats, fish, eggs and fermented raw dairy (from proper milk) should be introduced, as well as cooked vegetable … Gradually! The gut wall of babies is permeable for a reason, it is necessary to develop oral tolerance of a plethora of antigens from the environment. Introducing foods during that time ensures that the child develops tolerance and can eat natural food without reacting with allergies. When does the gut seal? When were solid foods traditionally introduced? When do our community members introduce solids? I conducted a poll in our Facebook group: Nourished Children. My question was “When did you introduce solid foods to your baby? If you have more than one and they stated at different times, please choose one for each! If after 6 months, please let me know why in the comments!” Poll options started at 4 months and continued monthly until 12 + months. 1 after 12 months or after. So the majority of people in our community who responded, 186 out of 266, or 70%, did introduce solid foods between 4 and 6 months, which is the recommendation made by the Weston A. Price Foundation. Baby wasn’t at all interested or refused solids. Happy and growing with just breastmilk. Practiced delayed clamping and weren’t worried about low iron levels as a result. Waited until babies could sit up unassisted, had a good pincher grasp and could feed themselves, and the tongue thrust reflex was not an issue. Concerns about starting too early: leaky gut/allergy connection. A number of people cited waiting for the first tooth, or for teeth to erupt. One cited waiting until babies could chew, which in her case with all three children was at about 8 months. Jen Allbritton, a Certified Nutritionist, notes the following signs in her Nourishing a Growing Baby article published on the Weston A. Price Foundation’s website: “When infants are ready for solids they start leaning forward at the sight of food and opening their mouths in a preparatory way. In addition, babies should be able to sit up and coordinate breathing with swallowing. Finally, infants will stop pushing their tongue out when a spoon or bit of food is placed in their mouth–a reflex common in infants that disappears at around four months of age.” What isn’t mentioned in Jen’s list, yet mentioned by some in our community, is the appearance of teeth as a sign of readiness. One woman in our community in explaining her choice to wait to introduce solids after 6 months wrote: “I waited for teeth [because] babies don’t create an enzyme that helps digest solids until teeth break through.” I asked Sally Fallon Morell about this claim and she responded: “Reference please?? But typically teeth come in at 6 months or before, and if they are coming in later, to me that’s a sign that additional nutrition is needed.” Dr. Natasha Campbell-Mcbride agrees: “I think Sally is right! The child may not have enough nutritional resources to grow teeth. Vitamin D is particularly important, the child needs to sunbathe.” I did not find a viable reference for the claim that babies don’t create an enzyme that helps digest solids until teeth break through. Dr. Natasha did not find any either: “Where is the evidence for this, I don’t see any.” Parents in a forum discussing the topic reported that their baby was born with a tooth or even teeth, yet, the consensus is that baby is not ready to be feed solids on day one. Clearly, there are a number of signs that indicate readiness. When/if I learn more on this topic, I can create another blog post, and update this one! Please note that our recommendations for baby’s first solid food is not actually solid food, but rather a fairly liquid, semi-solid pasture-raised egg yolk. Also, cod liver oil is recommended at 3 or 4 months. I don’t know that the debate about when to introduce baby’s first foods will ever be resolved, because like many parenting choices, there will likely continue to be a variety of opinions expressed. In any event, we clearly don’t advocate that babies be forced to eat solids by a particular date, but rather that they be introduced around 6 months, and as early as 4 if baby shows signs that they are ready. Each baby is unique, of course, so we would encourage you to watch for signs of readiness in your own baby. Be sure to see our Resources for Baby’s First Solid Foods which includes links for further reading. Please note that we don’t recommend rice cereal as baby’s first food or any other grains until 2 years ideally. 13 Responses to Is 4 months too early to introduce solid foods to a baby? Dr Natasha said above that “introducing foods during that time ensures that the child develops tolerance and can eat natural food without reacting with allergies.” but then at the end of the article it says grains should be delayed until age two. Wouldn’t this make babies more likely to have an allergic response, since they haven’t encountered grains until possibly over 1.5 years after introducing solids? I totally understand avoiding rice cereal and other grains as first/early foods, but two years seems longer than I’ve ever heard recommended. thanks!! Thanks for your reply! I definitely understand the need to properly prepare grains and that they are not a very nutrient dense choice. I’m mainly curious about the potentially allergenic affects of waiting until 2 years to introduce them, when current research and Dr. Natasha’s statement about introducing other foods early to avoid developing allergies seem to state the opposite. Thanks again for your reply, and all your posts. I love following your blog and facebook page! I will forward your question to her! She is away until December 12. I appreciate this so much. Glad I found the info before my babies were born. Introduced a soft boiled pastured egg at 6 months and my LO got a rash around his mouth immediately. Gave a natural antihistamine and went away. I tried again in a month the same thing but rash was less intense. Used ghee in cooked / puréed veggies and I believe a combo of that gave him eczema. I exclusively breastfeed and found I could’t eat any type of dairy or egg either. All process of elimination as I introduced foods slowly and had to put the pieces together – intuitively I believe I introduced too soon although he was 6 months and another variable could’ve been not enough healthy gut flora … He is almost 1 and still struggling with eczema as I find what triggers it. But I do follow Weston A Price Foundation’s recommendations all except dairy and egg. I give him pureed organic meats, homemade bone broth from grass fed cows, fermented veggies, fruit with coconut oil and collagen, etc. also supplement him and myself with Standard Process that I customize with the help of clinical nutritionist Dan Court at Holistic Wellness Alternatives in NY. If you have problems with your digestive system, it will make certain foods problematic through the breastmilk. You are also probably right about the lack of balanced gut flora in your little one. The GAPS diet can help heal digestion and balance gut flora in both of you. I recommend reading the book. Fantastic article. With my first two it was very hard to wait till 6 months because they were very eager to eat. My third had no interest until about 8.5 months. His interest coincided with other readiness signs like the tongue thrust reflex disappearing and the pincer grasp appearing. Interestingly, his first tooth showed up around the same time. My first child didn’t get his first tooth until 11 months. However, I am certain he was deficient in vitamin D, and the tooth erupted after I had been supplementing vitamin D for him. It would be interesting if the tooth factor could be studied, but I agree that late teething could possibly be caused by deficiencies. I would like your feedback on a problem. 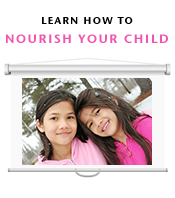 My daughter fed my grandaughter soy based formula for the first year, how can I help my grandaughter to detox from that and feed her nutritionally sound whole foods? she is 15 months old, and I am also trying to gently detox her from numerous vaccinations that she received. thank you for your help. i read the article on soy formula and am so scared.